The B-minor Mass has always represented a fascinating challenge to musical scholarship. Composed over the course of Johann Sebastian Bach's life, it is considered by many to be the composer's greatest and most complex work. The fourteen essays assembled in this volume originate from the International Symposium 'Understanding Bach's B-minor mass' at which scholars from eighteen countries gathered to debate the latest topics in the field. 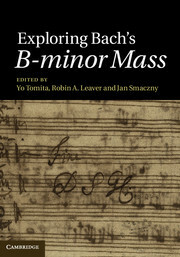 In revised and updated form, they comprise a thorough and systematic study of Bach's Opus Ultimum, including a wide range of discussions relating to the Mass's historical background and contexts, structure and proportion, sources and editions, and the reception of the work in the late eighteenth and early nineteenth centuries. In the light of important new developments in the study of the piece, this collection demonstrates the innovation and rigour for which Bach scholarship has become known.